When we think of the things a tow company hauls, we pretty much think of the obvious: cars and trucks. There are so many different types of tow trucks out there, so the things that can be hauled will vary. Considering Atomic, we can haul light- to medium-weight vehicles, empty tool boxes, empty sheds, and Class-C motor homes. We can also perform bed transfers – move a car/truck from the bed of a semi-trailer to the tow truck bed, and then to the ground – and we can haul forklifts. Basically, if it is under 10,000 lbs. and 20 ft., we can fit it on our bed. Recently, we had a first. At least a first for us as a towing company. We received a call for a bed transfer. Boy, were we surprised when we saw it! What an exciting experience! 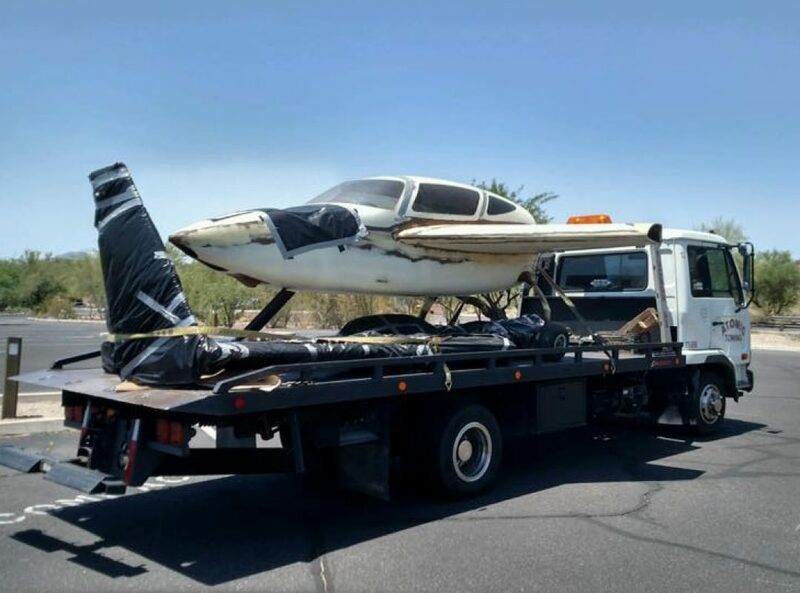 It looks like it needs a little work, but how many towing companies have you seen with a plane on their beds? We are always happy to answer your questions. If you have something unique to move, or you need assistance getting from A to B, please feel free to call us any time. Thank you for your consideration. Previous: Previous post: Summer is here! Dear Tim, I have seen a lot of websites and i have tallked to many busiesses that think they need one. But I want to congratulate you on a well constructed and well executed website. You have created an awesome extention of your business and discovered a way to let people know that you areq are there to serve them. People don’t care what you know until they know that you care. To me, it seems like every word expresses pride in what you do and how you do it. I wish you great success in your business – both on the web and on the highway. Thank you, Ken. I really appreciate that. In today’s world of everything being web-based, it’s hard to know what the right decision is. I know I need to add content more often, and I will try to do better. Thank you for your kind words.